Mexican authorities have banned Maya spiritual leaders from performing ceremonies at their ancestral temples, which are about to be overrun by a curious assortment of conspiracy theorists, dooms-dayers, new-agers and well-intentioned tourists who just want to be apart of the festivities. The Ceremonies are meant to mark the end of the Maya long-count calendar, which began 13 Baktun (cycles) ago. Under the Greco-Roman Calender, that’s about 3112 BC. Contrary to popular (mis)belief, the end of the long-count calendar is being viewed as something positive. As Mayan priest Jose Manrique Esquive recently pointed out, the current Baktun, which began around 1618, has been drenched by a continuous reign of misery that included the introduction of European disease, culture and language being erased and entire populations being extinguished. 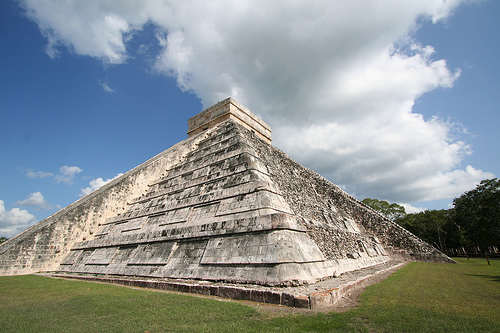 Despite their intentions, the government is refusing to let any Maya traditional perform their ceremonies inside Chichen Itza, Coban, Tulum and other sites that their ancestors built.